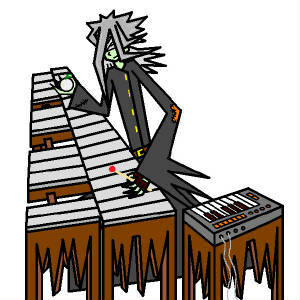 Once a famous pianist and composer in the late 1700's, G-Host is the resurrected and reanimated corpse of this man. The idea came about when Chris got into a phase of listening to his compositions throughout the entirety of Frostbite Studios Records, causing Fa_Sha to really latch onto the recordings. Over time, Professor Grim began to hear the music and told the other members of the band that he knew of where the man was buried. 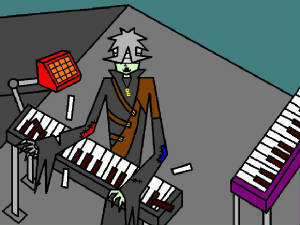 Through a long set of strange negotiations, Fa_Sha and Chris decided that, with the help of Professor Grim's odd supernatural abilities and knowledge, they would resurrect the composers corpse and have him join the band as a pianist. G-Host is known for his degrading green skin, mangy gray hair and long black cloak. He stands around nine feet high, although it is debatable whether he is levitating or not, putting him high above Chris as the tallest member of the band. The top half of his face is covered in bandages and he is forbidden to remove the blessed rosary used to subdue him from around his neck. On and offstage, he maintains a temperate mood, ranging from reclusive to powerfully agressive, and does not respond to what anybody says except for Professor Grim. Too many times he has randomly lashed out on an Icily Polite member, and has a tendency to destroy keyboards onstage, calling for the need to chain him to the ground when in front of an audience. Before it froze over, he lived in the haunted hall in Frostbite Studios Records. He now roams the crispy con, often appearing out of nowhere or disappearing randomly. Members have claimed to see him in seperate places at the same time, leading to the notion that he may be able to bilocate.